Spring has sprung! OK, so maybe not quite yet for everyone…but we're getting there. Late last week marked the first day of spring. For some of us, the beginning of spring means it still feels questionably like winter outside. But do not fear. We are staying positive that this wintry feeling is on its way out here soon. Spring is finally springing—let's keep this positive thought in mind through the rest of March and into the beginning of April! If you've been cooped up most of the winter, it's time to get inspired by the arrival of spring's longer, lighter, and brighter days. Get outside if you can; weather temperatures in the forties and fifties are totally bearable. 1. Do your own rendition of the spring happy dance. Splash in puddles. Dance in the rain. Even though it's very possible the rain is still quite cold, children will love getting out all the rain gear that's been buried in closets—raincoats, boots, umbrellas. If everyone's bundled up, splashing around in puddles is such a fun and freeing activity. A spring celebration is a special occasion! Wet weather is better than frozen weather, don't you think? 2. Bust out the sidewalk chalk. Get as colorful as possible. Ask your kids if they remember how fun it was to draw and doodle all over the sidewalk and driveway. If there aren't any rain puddles to go hopping about in, this is a great alternative. 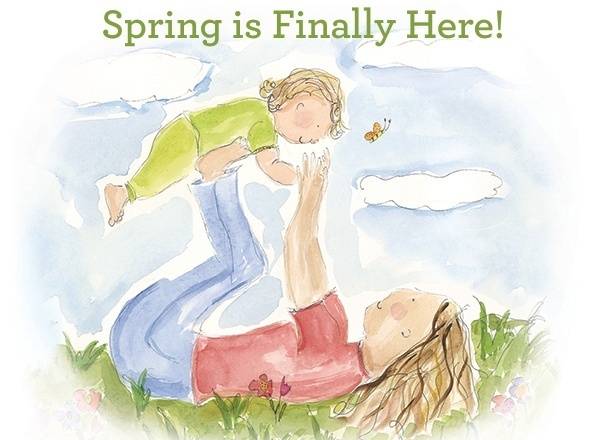 Maybe you can get them to even practice their cursive or handwriting, or encourage them to draw all things spring (a butterfly, a rain cloud, a blooming flower). 3. Find a hill or nice grassy area and watch the sunset. This is an activity you just can't pass up as we're transitioning into brighter days. Get the whole family, pack a pre-dinner snack, and enjoy one another's company. 4. Practice spelling and ABCs with sticks in wet mud or sand. Grab a stick and use it as a writing utensil. Your children will love getting the permission to get a little dirty and play in the mud. See if they can write out their name or any other fun words you can think of. 5. Stop by the park for a swing in the cool breeze. After this winter, your local park or playground could probably use a little love. Stop by to give your children a push on the swing, let them hang on the monkey bars, or run around on the (almost green!) grass. As for the too-dreary-and-rainy-to-get-outside days, or the days that feel and look strikingly similar to our winter ones, stay in and read a book that celebrates spring. Read books with pastel hues or watercolor illustrations. Our author Marianne Richmond (who currently lives in Minneapolis and is likely dreaming of spring right about now) is known for her beautiful, blooming watercolor and pastel illustrations. Check out the titles below for some spring-spiration and a warm reminder that brighter days are on their way. Put Me In The Story's personalized books for spring that will get everything around you bloomin'! Personalize Put Me In The Story's newest release by beloved author and illustrator Marianne Richmond. 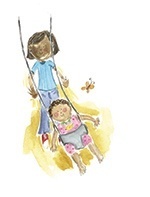 Illustrated in watercolor with pastels and soft tones, I'll Never Let You Go is a wonderful story about growing up and letting go, while holding on with all of your heart. Show your child the meaning of unconditional love illustrated through the sweet, personalized story of your child's affection for their most beloved best friend, Blankie! Every parent has experienced the powerful feelings of watching their child grow up while wanting to hold onto every moment a little longer. Now this favorite bestselling picture book from Marianne Richmond, If I Could Keep You Little…, can be personalized for your child to express those heartwarming feelings in words to remember forever. Marianne Richmond's I Believe in You is a vibrantly illustrated children's book that expresses everything that your child wants to hear. I Believe in You encourages your child to see their own strengths and talents as you do. Personalize this meaningful book with your child's name, photo, and message, and let your son or daughter's uniqueness shine brighter! 15 Minutes Outside: 365 Ways to get out of the house and connect with your kids, Rebecca P. Cohen.